Our papayas here at The Kul Kul Farm are coming into their prime. I harvested over 20kg of them this week and even had an exciting run in with a scorpion and small bird who had made an unfortunate real estate choice and put its nest between two of my ripe fruit. Although I did my best not to disturb the nest, I think I still scared my little java sparrow friend away. As for the scorpion I have no idea what he was doing in the papaya tree but I’m glad it didn’t bite me. Now that I have so many papayas coming off the land I need to figure out what to do with them. It seems there are far more uses for this fruit than expected. Here are 10 reasons why you too should plant your own papaya. 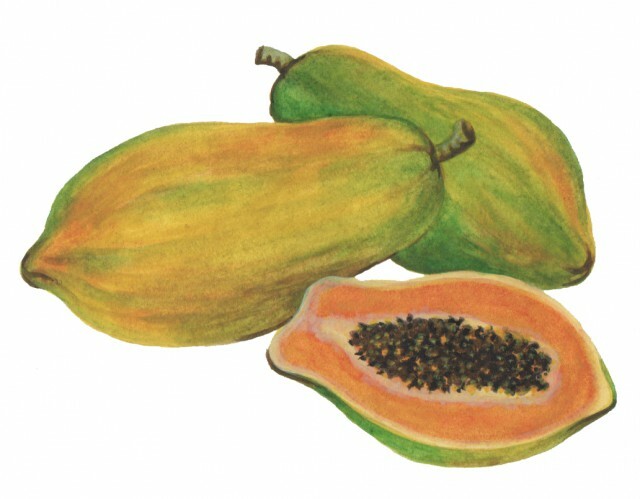 Like carrots, pumpkins, and sweet potatoes the papaya fruit is full of beta-carotene and vitamin A. It also has a high level of vitamin C, E and improves digestion due to a special digestive enzyme known as papain. Eat it fresh and often if you want to improve your cardiovascular system, be protected against heart diseases, heart attacks, strokes and prevent colon cancer. The papaya makes a better breakfast than carrots and is an excellent base for a smoothie. We chop ours into bite size chunks before they over ripen and put them in the freezer for an easy addition to our breakfast smoothie. If you’re impatient, try cooking with green (raw) papayas. These are most commonly used in Thai cooking to make the famous Green Papaya Salad known as Som-Tum. Here in Bali, we boil it and make a delicious urab by grating unripe papaya, boiling it and mixing it with grated coconut and spices. There is also a delicious Balinese soup known as Gedang Mekuah. If you live in Bali, or are visiting and you would like to have the ultimate green papaya experience venture to Bambu Indah for some dinner and request the papaya steak. This original delicacy is marinated for days in a balinese spice blend before being thrown on a charcoal barbeque and served. If you want to try unripe papaya make sure you cook it! Raw sap can be irritating to your skin. Raw, unripe papaya is known to help tenderize meat and is a good addition to a marinade. It can be used by grating the young papaya flesh and rubbing it into your meat of choice. The papain enzyme helps break down some of the protein. #3 The leaves and the flowers are just as amazing as the fruit. Don’t limit yourself to the fruit. If you grow your own papaya plant there is room to explore the lesser known treasures of this plant that are rarely available at the supermarket. Papayas come in three sexes: Male, female, and hermaphrodite. Only the females and the hermaphrodites bear fruit. The males let out a large quantities of spindly little white flowers that are wonderful steamed. I recently visited the island of sumba where I was surprised to see that the locals prise the male plants and make a delicious vegetable dish from them. The young leaves can be picked off the crown of the plant and blanched like spinach to be a tasty addition to your steamed vegetables. Male trees are also helpful in your garden to pollinate the female flowers. My dad first showed me the secret power of the papaya stem. It is the perfect eco-straw. Pick a sledder leaf off the tree, cut the leaf off then make sure to rinse the area where it was cut to avoid the raw sap touching your lips . I like them better than plastic straws because the whole is slightly bigger and it feels good on your teeth. It is the perfect straw for a young coconut, but also works for all other drinks including smoothies and milkshakes. Don’t forget to compost it when you’re finished your drink. Even the seeds are edible. They are spicy and can be dehydrated as a substitute for black pepper. Collect the seeds wash them, squeeze off the outer membrane (easy to do with a mortar and pestle) and put them in the oven on the lowest setting, in a dehydrator, or out in the sun for a day. Other applications are as a seasoning for meat and salads. You can also eat them straight out of the fruit although this can be intense and a bit spicy. Papaya seeds have a wide range of health benefits and are even believed to help cleanse your gut of parasites. 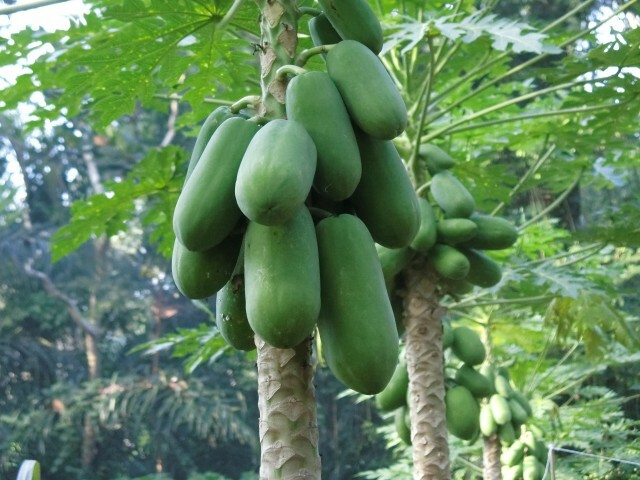 Papaya trees start bearing fruit at about 11 months after you plant them. It is considerably shorter than most delicious fruit that you eat except bananas that can bear fruit in as little as nine months. Once they start fruiting they keep fruiting. They can last for years, but they are most productive until they are under about three years of age. You can plant them from seed dirrectly in the garden. Avoid transplanting because the roots are sensitive and disturbing them can hurt the plant. If you want a long lasting healthy snack for the road or to impress your house guests I suggest the dried papaya. Slice them into 1cm think pieces and place them in a dehydrator for 12 hours. The result is a tender fruit leather that is twice as sweet as the fresh fruit. You can also dry them in the oven at a very low temperature if you don’t have a dehydrator. Even if you don’t like papaya and let the fruits rot on the tree or leave it to be eaten by the fruit bats, monkeys and squirrels it is hard to deny the beauty of this giant tree-like plant with its graphic leaves and simple form. It looks good, grows fast, and lasts long enough to enjoy it wherever it is growing, but not long enough to be a hindrance if you have other plans for the area it is planted in. You don’t have to stress its location. Some claim it symbolizes love and protection, others say that if you see one in your dream you are able to resolve emotional conflict. If you want to add a papaya tree to your garden for its looks make sure you don’t pick a place too close to the house. A strong wind will knock a papaya with weak roots over quite easily. But the plant is lighter than similar sized trees so I wouldn’t sweat it too much. I’m sure there’s plenty more we can be doing with this plant, including making creams and moisturisers, which we haven’t tried yet. If you know of any other uses for this wonderful plant please do share. Thanks for sharing this on My Meatless Mondays. All one has to know is how to do it and it hppaens and you will make it happen for a lot of others. Nowadays, with food so expensive, it is important to find all the secrets to bringing that bill down.